At the end of 2018, more than 135 million people were in need of humanitarian protection and assistance across the world, and a record USD 25.2 billion will be required to respond to those needs in 2019. These people have been forced to leave everything behind as they flee persecution, armed conflict, or natural disasters. Some may be unable to leave, and continue to live in the midst of conflict. Many are victims of violations of international humanitarian law and human rights law. These people need food, clean water, shelter, health, and other key services to survive, but they also need much more. Most humanitarian crises today are protracted necessitating humanitarian action well beyond short-term emergency responses. The vast humanitarian needs, as well as the challenges of responding to today’s complex crises, come starkly into light in what has become known as the Rohingya crisis. In August 2017, the massive influx of refugees to Bangladesh from Myanmar brought the world’s attention to the plight of the Rohingya people. They fled what has been described as ethnic cleansing and genocide in Myanmar’s Rakhine state, where they suffered generations of economic, social, and religious discrimination and suppression. Bangladesh currently hosts close to 1 million refugees from Myanmar, most of whom live in vast camps near the border and suffer precarious conditions. While Myanmar and Bangladesh have bilaterally agreed to repatriate these refugees, returns will not be safe, voluntary, and dignified unless conditions on the ground change and the returnees’ safety is ensured. During a visit to Myanmar in November 2018, all humanitarian actors who were interviewed on the ground expressed strong concerns about the first repatriation of refugees, set to begin at the end of that month. So far, however, no refugee has returned through official channels, and many Rohingya have continued to flee Myanmar as developments in Rakhine do not bode well for their future. Less often discussed are those Rohingya who remain in Myanmar. In addition to the August 2017 crisis, previous waves of violence in Rakhine state in 2012 and 2016 also led to internal displacement. Many Rohingya remain displaced in central Rakhine, living in camps that contribute to what Amnesty International has described as government-sponsored apartheid. Sittwe, the capital of Rakhine state, is an eerily peaceful place, where the locals go about their daily lives and through which tourists can safely transit to reach the archeological sites of Mrauk U. Just out of sight, however, and impossible to access without government authorization, are the twenty-three internally displaced persons (IDP) sites in which close to 130,000 people—most of them Rohingya—are confined. The government is working on a national strategy for the closure of IDP camps in Myanmar. Its methods for “closing” camps have received criticism from humanitarian actors, who have witnessed the government moving Rohingya people to new locations only short distances away from the camps, without consulting them, and leaving their living conditions largely unchanged. In northern Rakhine, many of the villages where the Rohingya used to live have been destroyed and burnt to the ground. For the Rohingya in Bangladesh as well as those remaining in Rakhine, returning to their places of origin is, at best, a distant prospect. Meanwhile, the needs of these populations are vast, and humanitarian actors and host communities are overstretched in Bangladesh. The camps are vulnerable to flooding, landslides, and cyclones during the monsoon season, which can cut off access to certain parts of the camps and affect the ability to provide necessary services. Camps are also severely overcrowded and were described by Médecins Sans Frontières President Joanne Liu as a “public-health time bomb.” The reality is that most are unlikely to return to Myanmar in the foreseeable future, forcing donors and actors on the ground to look at longer-term plans to improve the prospects for the integration of the Rohingya in Bangladesh. Across the world, humanitarian action is challenged by crises that are increasingly complex. Unprecedented movements of people, fighting in urban areas, and crises that become protracted are forcing humanitarian actors to learn and adapt. In Rakhine, humanitarian actors must grapple with the consequences of providing aid in a protracted crisis while the government of Myanmar commits ongoing grave human rights abuses. The devastating human rights situation complicates engagement in more development-oriented efforts, that risk supporting and strengthening the government’s policies. There is therefore a need to better leverage the government’s interest in development for changes in the human rights and humanitarian situations. The evolving understanding of the role of affected communities in responding to their needs is also challenging traditional understandings of humanitarian action. In Myanmar, like elsewhere, efforts to involve local communities remain ad hoc and insufficient, and must be better systematized to ensure that local voices influence strategy and programming. Ultimately, as former United Nations High Commissioner for Human Rights Sadako Ogata famously stated, “there are no humanitarian solutions to humanitarian problems.” In many countries across the world, from Syria and Yemen to Myanmar, the solutions to crises will need to be political. 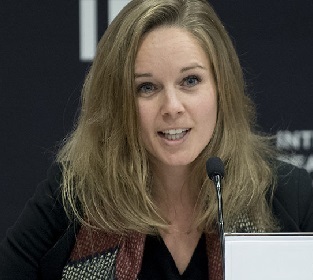 Alice Debarre is a Policy Analyst at the International Peace Institute, where she heads the Humanitarian Affairs program. Her current work focuses largely on issues relating to the delivery of healthcare in situations of armed conflict, as well as on tensions between counterterrorism and humanitarian action, and IDP-related issues. Before joining IPI, she was an associate in the Policy and Diplomacy division of the International Committee of the Red Cross in Geneva. She has also worked on human rights and national security issues at Human Rights First in Washington D.C., and for the International Humanitarian Law Unit of the American Red Cross. Alice is a qualified lawyer in New York, and holds a LL.M. in International Law from the Georgetown University Law Center.